Cleanses sometimes get a bad reputation, but they are a way to recharge, rejuvenate and renew your body’s systems. A cleanse does not mean you only eat grapefruit, or sip on water with cayenne pepper for seven days. A cleanse can simply be a way to eliminate all toxins from your diet and give your body the nutrients it needs to detoxify and perform optimally. Over-the-top restriction is a perfect recipe for failure. Extreme cleansing methods can actually have more negative than positive impacts, such as hair loss, loss of lean muscle mass, and blood sugar and electrolyte imbalances. Cleanse by eliminating potentially harmful foods and boosting your intake of healthy natural foods. Keep yourself nourished while ridding your body of detrimental chemicals by consuming whole, unprocessed foods, and loading up on fruits and vegetables, going organic whenever possible! There are four important components to cleansing in addition to whole, unprocessed foods. You need all the fluids you can get during a cleanse! Toxins are eliminated through sweat, urine, and stool, so drink up to keep toxins flowing on out. 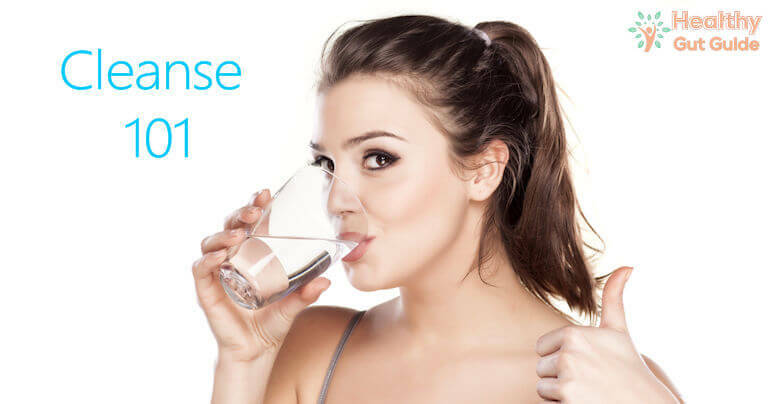 If you are dehydrated during your cleanse, you will feel fatigued, likely suffer from headaches and most importantly, you won’t efficiently expel toxins! Preferably, drink lemon water throughout the day. Drinking lemon water improves digestive function, strengthens the immune system, promotes healthy skin, cleanses the urinary tract, detoxifies the liver, promotes healing, curbs appetite and improves overall health and wellbeing. Reach for the herbs and spices. Herbs and spices contain nutrients and compounds that support the detoxification process and make excellent cleansing additions. Keeping foods interesting and flavorful will help you stay on track with a cleanse. Some great herbs and spices to incorporate include cilantro, basil, dill, parsley, onions, garlic, ginger, rosemary, turmeric, curry and Garam Masala. The intestines play a large role in the detoxification process, and probiotics help keep intestines in tip-top shape by replenishing the healthy bacteria in the colon. Probiotics protect the body from toxins, support immune function, make B vitamins, metabolize carcinogens, and ferment nondigestible fiber to increase nutrient absorption. Probiotic supplementation or increased consumption of fermented foods to support intestinal health is a great addition to a cleanse. Some great fermented foods to incorporate are miso, tempeh, kombucha and vinegar. Supplementation can help ensure you get all of the nutrients your body needs to properly cleanse. Talk to a doctor or registered dietitian to see if a supplement would be right for you. Keep in mind, cleansing isn’t exclusively about what you eat. You can additionally support your body in some more holistic ways during your cleanse. Take a sauna or steam bath. Since one of the ways toxins leave the body is through your sweat, a sauna or steam bath can support a detox. Barely anyone gets enough sleep these days. A detox is an excellent time to make sure you are getting all the rest your body needs. Exercise is an important part of the detox process. Get your body moving, your metabolism flowing, and eliminate those toxins! The end of your detox is a perfect time to identify your personal problem foods and triggers. At this point you have eliminated caffeine, refined sugars and carbohydrates, alcohol, meat, dairy, and gluten and it would be counterproductive to go right back to excessively consuming these foods. Instead, re-introduce foods one at a time and pay attention to how your body reacts. This is a great way to find out how different foods affect your mood, cravings, and energy level. Maybe you have a cup of coffee in the morning and you feel absolutely fine, but one cup of dairy and you are too sluggish to exercise. Everyone reacts differently to foods, and this is your chance to personalize your healthy diet. The benefits of cleansing are not limited to weight loss. A cleanse may naturally boost your energy, rid the body of excess waste, decrease the risk of colon cancer, improve GI health, strengthen your immune system, improve your skin complexion, provide anti-aging benefits and improve your general sense of well-being. The reality is, we live in an overtoxified, undernourished world and could all benefit from cleansing. Consider incorporating cleansing into your healthy lifestyle. You are sure to be pleased with your results!